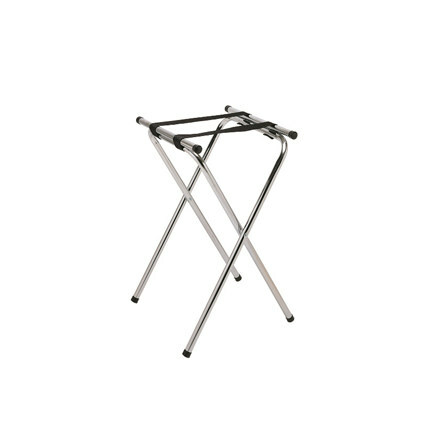 This sleek, eye catching 31" chrome tray stand is an attractive addition to your event. This folding tray stand is bound by sturdy hinges that allow it to close and flip open for the ultimate in space saving storage efficiency. There are two secure, black belts stretching across the top to form a reliable platform for all of your serving trays, while tough black rubber feet provide the unit with additional stability, even on wet surfaces, and protect your floors from scratches.